Does your product or brand have an online community? Yes? As a community manager, are you looking out for custom swag to engage your community members better? Custom Printed Stickers are a great idea for swag. Top 5 reasons to use Custom Printed Stickers as cool Swag. 1. Stickers are fun, colorful, easy to apply, can be used on multiple surfaces. 4. Designed appropriately, your sticker has the potential to go viral on social media. Community members will stick your stickers everywhere, and post pictures on Social Media. We present 4 examples where online communities have successfully used custom printed stickers as swag. In 2005, when Alexis Ohanian and Steve Huffman founded Reddit, they did not have a massive budget for advertising. With an initial restrictive budget of $500 for marketing and promotion, Reddit has gone on to be one of the most popular websites in the United States. So how did the founders market Reddit? They printed stickers and pasted them everywhere possible (read signs, poles, over other advertisements). They would hand out these custom printed stickers at events, meetups or to random people on the street. 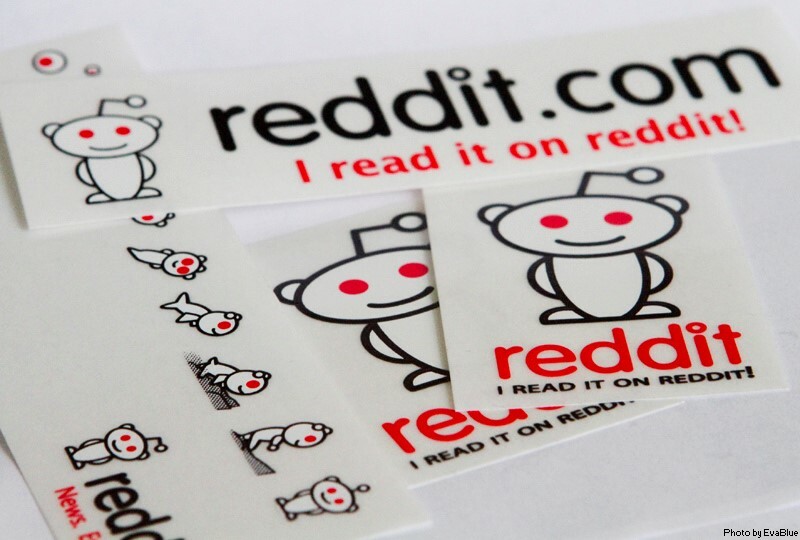 The focus was to build a great product and community online, with stickers being a way for people to show their allegiance to Reddit. Today Reddit is a major website and does not have to rely only on stickers for promotions. Even so, its stickers have stood the test of time and have major fans of their own. Several subreddits use stickers to engage and bond with their communities. Buffer is a social media management tool which helps businesses and marketing teams to schedule posts, analyze performance, and manage all their accounts in one place. Buffer engages it online community and customers by hosting meetups, sending hand-written notes, swag and special gifts. From the very beginnings of Buffer, the founder and co-founder, Joel and Leo, sent hand-written thank-you cards and stickers to customers. 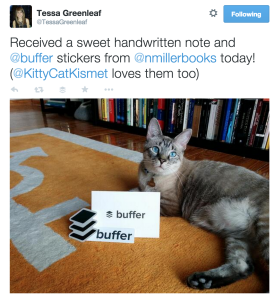 Buffer gets a lot of user-generated content on its social media; thanks to the great swag and personalized notes it sends out to its community. A post from Nick Westergaard, social media expert and a guest at chat sessions conducted by Buffer. Spotify is a digital music, podcast, and video streaming service that gives users access to songs and other content from artists all over the world. Spotify has an active community where users go to get help and to help others on music and related content related issues. Spotify has a ‘’The Spotify Rock Star’’ program that recruits experienced users to help on Community forums, or on Twitter, to earn points and get rewards. Rewards include premium membership to Spotify plans, swag such as t-shirts, hoodies, pens, stickers, headphones, and much more, and an all-expenses paid trip to Spotify HQ. WordPress is an online, open source website creation tool written in PHP. It is one of the most powerful and popular blogging and website content management system (or CMS) in existence today. WordPress has online communities such as WordPress Help for Beginners and Advanced WordPress to actively help users and developers. If you want to create cool sticker swag for your online community, get in touch with us as sales@gumtooStickers.com.